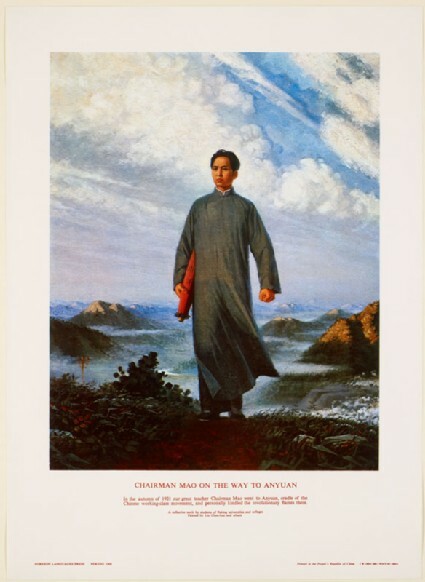 The original oil painting in this poster was produced by Liu Chunhua for a Red Guard exhibition in 1967 on the theme of Mao’s visit to Anyuan in 1921. Anyuan was a coalmining area famous for the workers’ strikes that took place there in the 1920s. According to the communist party history current in the 1960s, the strikes had been organized by head of state Liu Shaoqi. The 1967 exhibition and this painting in particular, in which Mao replaces Liu in one of his best-known achievements, were part of Mao’s campaign to discredit Liu Shaoqi. 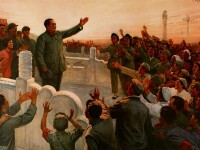 In 1967 Jiang Qing declared the image a suitable model for Cultural Revolution art and the total number of reproductions of it, including Mao badges and postage stamps, has been estimated by the artist at nine hundred million. It first circulated in the People’s Pictorial and as a colour supplement to The People’s Daily , The People’s Liberation Army Daily and Red Flag magazine and was published without an artist’s name. It was then credited as ‘created by the Student Group of the Beijing Academies, executed by Liu Chunhua and others’. Liu’s name was in fact Chenghua but the misprint was only discovered after several hundred thousand copies had been printed, and he has since gone by the name Liu Chunhua.